Having the correct, to-spec alloy composition for each part or component is perhaps no more important anywhere than in medical device applications. Medical devices, whether for use in a hospital setting or attached to a human being internally or externally, must meet the highest standards of reliability. For this reason, 100% alloy grade identification is essential in any component of a medical device in which the proper functioning and reliability depends on a to-spec alloy grade. Contact Bruker today to learn more about quick, easy analysis and grade identification of medical devices and their components. 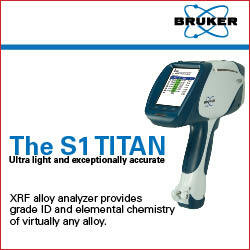 Eliminate materials mix-ups and potentially life-threatening errors with the Bruker S1 TITAN. Contact one of our experts today to learn more and get your specific questions answered.